Network management is defined as the process of managing a network for fault and performance using various tools and technologies to keep up with the business requirements. The objective of network management is to achieve an error free network. In today's environment, multiple network management tools are employed making the whole process a complex one. The biggest challenge with today's network management solutions, is to proactively identify faults before it impacts end-users. OpManager detects, isolates and troubleshoots faults, raises alarms to remediate faults quickly. Set multiple thresholds for performance metrics. Get proactively notified for threshold violations and faults through email and SMS. Process SNMP traps and syslogs and raise alerts. Automatically log alarms as tickets into a service desk software. Performance management involves troubleshooting faults either through a manual or automated approach so that the performance of the network is restored to its original or improved condition. OpManager offers basic and advanced network troubleshooting tools to fix faults that degrade network performance. Inbuilt tools - OpManager offers a variety of tools such as ping, traceroute, MIB browser, remote control, and more to troubleshoot basic performance issues. NCM module - OpManager includes a network configuration management module to manage configuration changes. With this, it is easier to automate configuration backups, adhere to compliance policies, and detect network changes in real time. Network provisioning involves calculating the load handled by the network and future demands based on the current network trend. It also involves keeping resources in reserve so that when a need arises, it becomes easier to handle. 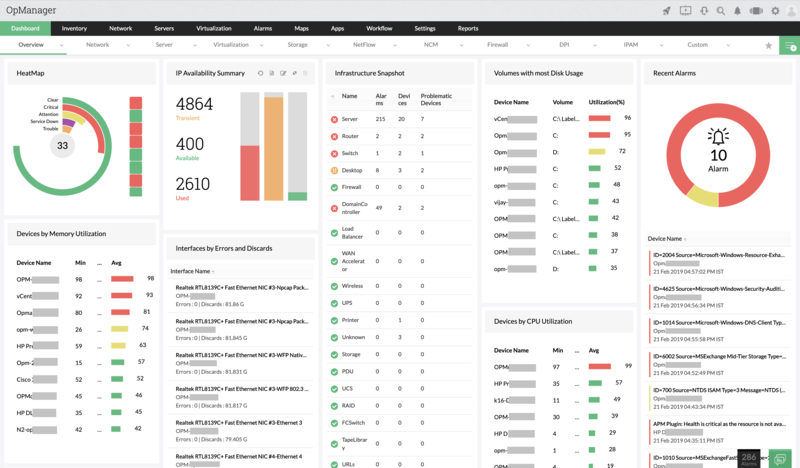 Capacity Planning Reports - OpManager is pre built with 150+ network management reports that provide information on device upgrades, bandwidth usage, disk & memory utilization etc. These reports help in identifying network trends and assist in resource allocation. IP Address and Switch Port Management - OpManager's IP address & switch port management console, helps in managing IP addresses and switch ports for space and availability. OpManager tackles IP and switch port conflicts, audits user access and provides prompt notifications on status changes. It is common for network performance to degrade as years pass by. Therefore, it is essential to deliver quality IT services to end-users meet the SLA month on month. OpManager, the network management tool helps you adhere to service level agreements and achieves 99.9% availability for your network and business critical applications. With business level dashboards, it is possible to detect the factors affecting your business in real time. Enterprise Network Management involves on-demand and scheduled tasks such as troubleshooting network faults, executing backup scripts etc. Most of these tasks are repetitive and time consuming. Automating such management tasks will help admins and technicians save a lot of time and effort. For example, whenever you get a device down alarm, you will ping the device and do a traceroute to know if there is any packet loss, where exactly it is happening or if the device is actually down. These repetitive tasks can be automated with workflows.OpManager, the trusted network management and monitoring tool supports around 80 actions that can be automated with workflows. Automatically stop/restart a service or a process. Execute scripts and verify its output. Detect the last changes done on a network device. Network configurations are important for any network, and any change in them adversely impacts the security, reliability and the quality of service provided. These changes are complex to manage and this increases multi-fold when done manually and requires robust network management configuration tools. According to an internal survey, nearly 50% of IT pros agreed that changes to network configurations led to outages several times a year. In these cases, a configuration management tool will be handy to prevent such changes in the first place or roll back immediately. OpManager's network configuration module aids in network management by automating configuration backups, detecting network changes and ensuring that the compliance policies are adhered to. With approval based configuration changes, administrators can be aware of any external network changes by allowing or denying network users to make changes to device configurations. Discovering and remediating network policy violations. Executing scripts automatically to combat unauthorized network changes. Visualizing trends in device configuration changes. Verifying configurations/device for PCI compliance. For in-depth enterprise network management and monitoring, click here.